Ta'if (Arabic: ٱلطَّائِف‎; aṭ-Ṭāʾif) is a city in Mecca Province of Saudi Arabia, at an elevation of 1,879 m (6,165 ft) on the slopes of the Sarawat Mountains (Al-Sarawat Mountains). It has a population of 1,200,000 people and the 5th largest city in Saudi Arabia and is the unofficial summer capital. The city is the center of an agricultural area known for its grapes, pomegranate, figs, roses and honey. The inhabitants of Ta'if are largely made up of Saudi Arabian tribes. There are also significant foreign populations of expats, primarily from Asia, Turkey, and other Arab countries that are also present in Ta'if. In the 6th century CE, the city of Tā'if was dominated by the Banu Thaqif tribe, which still lives in and around the city of Taif today. It has been suggested that Jewish tribes who were displaced by Ethiopian Christians in the Himyarite Kingdom wars settled near Taif. The walled city was a religious centre as it housed the idol of the goddess Allāt, who was then known as "the lady of Tā'if." Its climate marked the city out from its dry and barren neighbours closer to the Red Sea. Wheat, vines, and fruit were grown around Tā'if, and this is how the city earned its title "the Garden of the Hejaz". This city was involved in the events of the Year of the Elephant. Both Ta'if and Mecca (about 100 km (62 mi) to the northwest, were resorts of pilgrimage. Ta'if was more pleasantly situated than Mecca itself and the people of Ta'if had close trade relations with the people of Mecca. The people of Ta'if carried on agriculture and fruit‑growing in addition to their trade activities. In the early 7th century, Muhammad, who was born in Makkah, preached Islam to the inhabitants of Makkah and the Hijaz, and encountered resistance from many of the people here, including at Ta'if. In 630, the Battle of Hunayn took place at Hunayn, close to this city. Shortly after that, the unsuccessful Siege of Ta'if took place. The city was assaulted by catapults from Banu Daws, but it repelled the attacks. The Battle of Tabouk in 631 left Tā'if completely isolated, so members of Thaqīf arrived in Makkah to negotiate the conversion of the city to Islam. The idol of Al-lāt was destroyed along with all of the other signs of the city's previously pagan existence. On 17 July 1517, the Sharif of Mecca capitulated to the Ottoman Sultan Selim I. As a sign of this, he surrendered to him the keys of the Islamic cities of Mecca and Medina. As part of the Hejaz, Ta'if was also given over to Ottoman control. The city remained Ottoman for a further three centuries, until in 1802, when it was retaken by rebels in alliance with the House of Saud. These forces then proceeded to take Mecca and Medina. The loss was keenly felt by the Ottoman Empire, which viewed itself as the protector of the Holy Cities. The Ottoman sultan, Mahmud II, called upon his nominal viceroy in Egypt, Muhammad Ali, who launched an attack on the Hejaz and reconquered Ta'if in 1813. In 1813, the Swiss traveler and orientalist Johann Ludwig Burckhardt visited Ta'if. He left an eyewitness account on the city just after its recapture by the Muhammad Ali, with whom he obtained several interviews while he was there. Burckhardt reported that the wall and ditch around the city had been built by Othman el Medhayfe. There were three gates and several towers on the city walls, which, however, were weak, being in some places only 45 cm (18 in) thick. Burckhardt stated that the castle had been built by Sharif Ghalib. He noted the destruction of the city caused by the conquest of 1802. Most of the buildings were still in ruin while he was there, and the tomb of Abdullah ibn Abbas – cousin of Muhammad and ancestor of the Abbasids – had been severely damaged. He also recorded that the population of the city was still mostly Thaqīf. In terms of trade, the city was an entrepôt for coffee. The castle and military barracks in Ta'if were repaired by the Ottomans in 1843, a hükûmet konağı – mansion for government business – was built in 1869, and a post office was established sometime later. Prior to the Arab Revolt, Ahmed Bey had been made the commander of Ottoman forces in Tā'if. He had under him a force of 3,000 soldiers and 10 guns of the mountain artillery. Ghalib Pasha, the governor of the Hejaz was also present in the city. In 1916, the Hashemites launched their revolt against the Ottoman Empire in Mecca in June. That city had fallen and then in July, Abdullah, the eldest son of the Hashemite leader and Sharif of Mecca Husayn ibn Ali, was sent with seventy men to Tā'if. Whilst his activities in the area aroused the suspicion of Ahmed Bey, Ghalib Pasha was unconcerned by so small a force. Abdullah secretly built up his army to 5,000 men. He then cut the telegraph wires to the city and then went on the attack. All Hashemite assaults on the city were repelled by the mountain guns, and both sides settled down to an uneasy siege. However, Hashemite guns were slowly brought up to Tā'if, and then the city held out a little longer; it finally surrendered on 22 September. The city thus later became a part of the self-proclaimed Hashemite Kingdom of Hejaz. Ta'if did not remain in Hashemite hands for very long however. Tensions between the king of the Hejaz, Husayn ibn Ali, and Abdulaziz al-Saud, the sultan of Nejd, soon broke out into violence. Although hostilities subsided in 1919, by September 1924 the then Saudi-sponsored Ikhwan (militia) under the leadership of Sultan bin Bajad and Khaled bin Luwai was ready to attack Ta'if. The city was supposed to have been defended by the king's son, Ali, but he fled in panic with his troops. Three hundred of Ali's men were slain by the Ikhwan in what became known as the Ta'if massacre. In 1926 Abdulaziz al-Saud was officially recognized as the new king of Hejaz. Ta'if remained a part of the Kingdom of Hejaz until Abdulaziz al-Saud unified his two kingdoms into one under the title of the Kingdom of Saudi Arabia in 1932. In 1934 the treaty was signed here that established the boundary lines between Yemen and the kingdom. The king himself was later to die in the city on 9 November 1953, as did King Khalid in 1982. Ta'if was still little more than a medieval city when the Saudis took control of it. However, they later embarked on a project of modernizing the city. Saudi Arabia's first public power generator was set up in Ta'if in the late 1940s. In terms of building roads to the isolated city, in 1965 the then King Faisal inaugurated the 54 mi (87 km) mountain highway between Mecca and Ta'if, and in 1974 the 400 mile Ta'if-Abha–Jizan highway was started. By the 1991 Gulf War, Ta'if was such a modern city in terms of communications that it was chosen as the site of the Rendon Group's television and radio network, which used to feed the news to Kuwait during the occupation of Kuwait by Iraq. Al Rudaf Park: A large natural park in the south of Taif, where trees stand amidst magnificent weathered granite rocks. The site also has a small zoo. Wadi Mitna: Muhammed's sanctuary in 619 AD. Muhammed came here to gain the support of the Hawazeen and the Tawfiq but was stoned by the tribes. He was later given sanctuary by his fellows in a small house now used as a mosque. Ta'if rose plantation. In the month of April, the rose fields are filled with these small fragrant pink roses that are picked at dawn and later distilled into expensive Ta'if rose oil. The famous rose of Ta'if is the 30-petal damask rose, which has a robust, spicy, and dizzyingly complex scent which has been used in several luxury perfumes, including Ormonde Jayne Perfumery, Chanel and Guerlain. Shubra Palace, the regional museum of Ta'if, located in a building of around 1900, which served King Abdul Aziz as a lodging in the 1930s at several places on this page about Taif. Rock-carving site: Located 40 km (25 mi) north of Taif, this was the site of the Okaz Souk, the largest and best known of the pre-Islamic souqs or gathering places. The souq was a scene for annual social, political and commercial gatherings. It was also the location of competitive recitation of poetry and prose. The buildings remain, including prominent outlines of walls of basaltic stone. Nature reserve: Between Al Hada hospital and the Sheraton Hotel at the top of Al Hada mountain is a large nature preserve at an elevation of 2,100 metres (1.3 miles) above sea level. Al Hada means "tranquillity", and this preserve of trees and plants offers a true respite. It is also a place to catch the sunset over the mountain. Ash-Shafā: A small village situated high upon the Sarawat mountains at an elevation of 2,200 to 2,500 metres (1.4 to 1.6 miles) above sea level, rich in agricultural products. The fruit gardens of Taif are located here. A camel ride is available, and nearby is Jabal Daka. When driving to Jeddah from Ta'if, non-Muslim travellers will have to use the non-Muslim bypass to get around Mecca, this adds about 110 km (70 mi) to the trip. Ta'if has an airport, Ta’if Regional Airport, offering both domestic and international destinations. The airport is located 30 km to the east of Taif, and 70 km (43 mi) from Mecca. 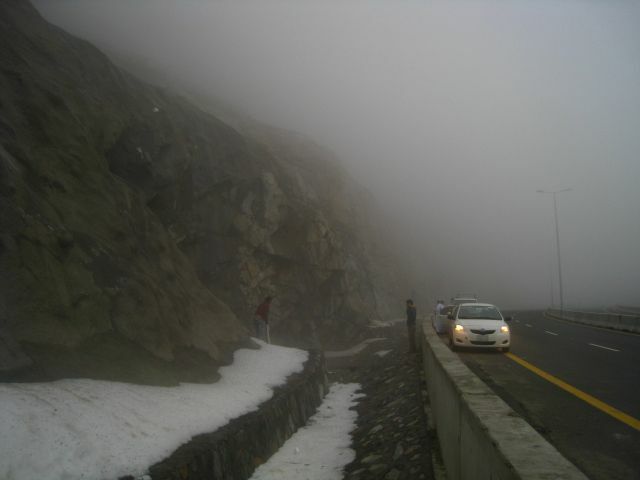 Taif has a hot desert climate (Köppen climate classification BWh), with hot summers and mild winters. Temperatures are not as extreme in summer as for lower-lying regions of Saudi Arabia. It is much cooler in Taif during the summertime than it is other parts of Saudi Arabia, particularly Riyadh. Precipitation is low, but all months see some rain, with more rain in spring and late autumn than in other months. Historically Ta'if grew roses, which were distributed throughout Central Asia. The historically well known tribe of Thaqif still lives in and around the city of Taif. ‘Utaibah عتيبة Otaibah' (Arabic: عتيبة, also spelled Otaiba, Utaybah, "Otaibi" and Uteibah) is another Adnani tribe who still lives in Taif. Bani Hareth is one of the Qahtani Arabs tribes living around Taif in Saudi Arabia. The tribe is one of the biggest tribes in the area and occupies the full area between Taif and Al Qunfuthah in Saudi. Bani Adwan is one of the Adnani Arabs tribes living originally in the northern part of Ta'if, and in the southern part of Jordan. Thu Al issba'a Al Adwani (in Arabic) is a poet and a man of wisdom of the tribe In the pre-Islamic era. Furthermore, Banu Thabet are people descended from Thabit. The tribe is originally part of Otaibah clan. and at least four others. Muhammad bin Qasim, the general who conquered the Sindh and Punjab regions along the Indus River. Hani Hanjour, 9/11 hijacker pilot who crashed american airlines flight 77 into the Pentagon. Hadi Soua'an Al-Somaily (b. 1970) First Saudi Olympic medal winner. Addas – a young Christian slave boy who was the first person from the western province of Taif to convert to the religion of Islam. Talal Maddah, an Arabic song icon who lived a great deal of time in this city. Also had performed concerts in it, worked in the post office in his early life. One of his remarkable song is a tribute to the city titled by "Jeena Min At Taif", in which he describes the beauty of both the city and its charming weather. Furthermore, Taif is flirted in other occasions and songs, for examples: "Ya Misafer Ala At Taif" by Abu Bakir Salim and others. The contents of this article incorporate material from an entry in the Enciclopedia Libre Universal, published in Spanish under GFDL. 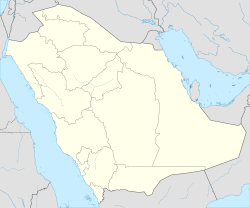 ^ "List of cities and towns in Saudi Arabia". Encyclopedia Britannica. Retrieved 2019-04-12. ^ "Brief about Ta'if City". Ta'if City. Retrieved April 26, 2016. ^ "Al-Ṭāʾif | Saudi Arabia". Encyclopedia Britannica. Retrieved 2019-04-11. ^ Hirschberg, Haim Ze'ev (1972). "Arabia" In Encyclopaedia Judaica. 3. Jerusalem: Macmillan. p. 234. ^ "The Prophets of Islam - Muhammad". Islamawareness.net. Retrieved 2012-01-17. ^ a b "The Excellent Exemplar - Muhammad". Al-Islam.org. Retrieved 2012-01-17. ^ Hisham Ibn Al-Kalbi - The Book of Idols. ^ Ibn Ishaq - Sīratu Rasūlu l-LāhHawting. ^ Burkhardt, John Lewis (1829). Travels in Arabia. London: John Colburn. Retrieved 27 November 2017. ^ Merriam-Webster's geographical dictionary. (1997). (Third edition). Springfield, MA: Merriam-Webster Inc. p. 1152. ISBN 0-87779-546-0. ^ "Foundations: The Pillars". Saudi Aramco World. Archived from the original on 2012-02-02. Retrieved 2012-01-17. ^ "Masterpieces By The Million". Saudi Aramco World. Archived from the original on 2012-02-02. Retrieved 2012-01-17. ^ "Made In: Saudi Arabia". Saudi Aramco World. Archived from the original on 2012-02-02. Retrieved 2012-01-17. 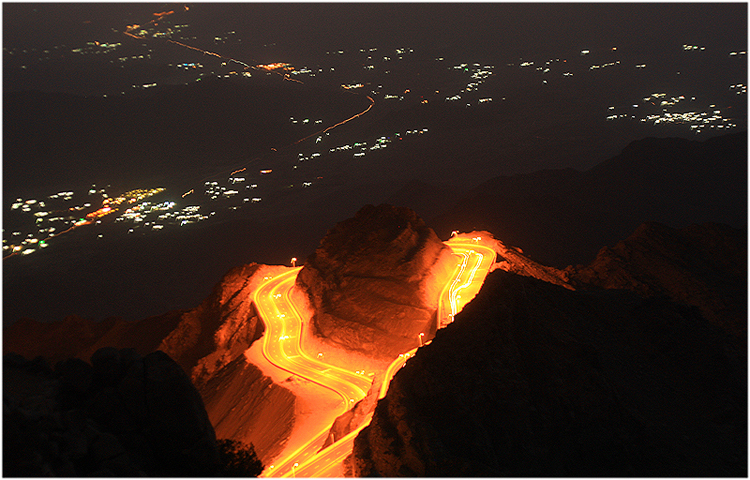 ^ "Guide to Exploring Taif a.k.a City of Roses". Gurfati. 2017-03-13. Retrieved 2017-05-02. ^ "Taif City Profile, Saudi Arabia". The-saudi.net. 1953-11-09. Retrieved 2012-01-17. ^ a b Cuddihy, Kathy (2001). "18". An A to Z of Places and Things Saudi. London: Stacey International. pp. 174–209. ISBN 1-9009-8840-2. ^ "المنتديات - الطائف نت". Taifcity.net. Archived from the original on 2014-11-02. Retrieved 2013-04-06. ^ "Surface annual climatological report". PME. Archived from the original on 2016-03-04. Retrieved 2015-12-23. ^ Maclean, Derryl (1989). Religion and Society in Arab Sind. Brill Academic Publishers. pp. 22–29. ISBN 90-04-08551-3. ^ "Great Leaps: Saudi Arabia's First Olympic Medals". Saudi Aramco World. Archived from the original on 2012-02-02. Retrieved 2012-01-17. ^ "طلال مداح جينا من الطائف". YouTube. 2009-06-05. Retrieved 2012-01-17. ^ "بوبكر سالم بلفقيه أغنية يامسافر على الطايف". YouTube. 2007-12-21. Retrieved 2012-01-17. ^ "USC-MSA Compendium of Muslim Texts". Usc.edu. Archived from the original on 2008-12-13. Retrieved 2012-01-17. ^ "Travels in Arabia; comprehending an account of those territories in Hedjaz which – Project Gutenberg". Gutenberg.org. 2005-12-01. Retrieved 2012-01-17.